* Hinged upper canvas support allows quick folding for transport. * Adjustable rear leg for angle up to 15-degrees. 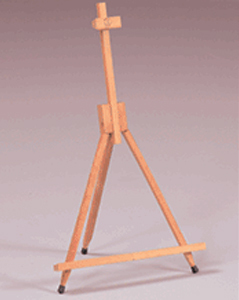 * Telescoping center mast accomodates up to a 24" canvas. * Overall size: 15" W x 15" D x 18 - 29.5" H.
* Made of Natural Hardwoods.